Garage doors may need repairs for many reasons, such as when the cables are broken or frayed, or when they have misaligned sensors or even broken springs. Whatever the reason may be, one thing is inevitable, garage doors need repairs at one time or another. Unfortunately, garage door repairs are costly and inconveniencing and most times, they happen when you need to access your garage the most. However, before you run to call the experts in Parksville garage door repairs, find out what kind of a problem it is. There are a few maintenance repair tasks you can do yourself and some that require specific tools and professional expertise. In this article, we will delve into the how to’s of troubleshooting your garage door to get it working smoothly in no time. There are two elements of a garage door, the garage door openers and the door itself. Below we’ll discuss how you can conduct minor repairs on both. A noisy garage door can be uncomfortable and annoying to a person who sleeps above the garage door. The noise can result due to lack of lubrication, or wear and tear. To fix the screech, first examine the tracks and rollers of your garage door openers. If they haven’t been cleaned in a while, brush them and lubricate them. If this does not work, try replacing a few parts and then lubricating them again. Cold temperatures could stiffen the parts of your garage door, causing it to lose power. Thankfully, most garage door openers have manual adjustments for lowering and raising the door. Adjust these settings routinely for optimal performance all year round. Older wooden garage models often have this problem. Aging can cause this to happen on a garage door. If this happens, you can tighten the saggy door using the tension rods found on the back of the door. The tension rods are fitted diagonally from the bottom to the top corners on the door. All you need to do is tighten the tension rods at the turnbuckle to align the door and have it working optimally again. 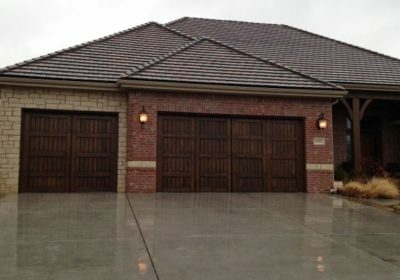 Garage doors have evolved over the years. They are better and more functional today. However, some days, the garage doors may decide to take a leave and not do their job right. In the event your garage door won’t lock, the problem could likely be that the horizontal bars on the garage door openers are not correctly aligned with the locking slots. The horizontal bars on a garage door move from the centre of the door into the slots along the side of the door in the door tracks. They are designed to lock the door in place by interlocking with the locking slots. To solve this problem, simply realign the horizontal bars by repositioning them in a position they can interlock with the bars and then lubricate them so that they can move freely. Most people spend a big chunk of cash to buy attractive garage doors for their homes but forget that regular maintenance is important. Garage doors are susceptible to the ravages of time and if proper maintenance is not done, problems may start to rise. Though it is easy to deal with some minor repairs, ensure you hire the best Parksville garage door repair experts for bigger troubles with your garage door.